Absolutely! 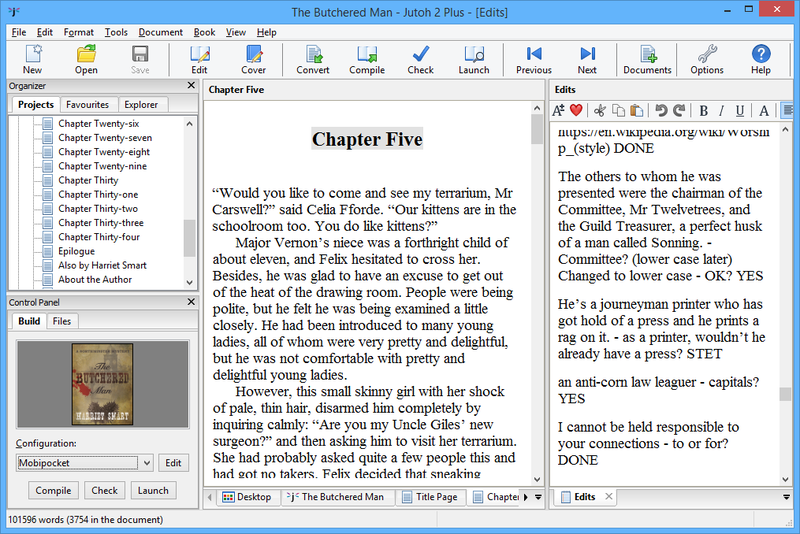 Jutoh’s editor has a rich set of editing and formatting tools, and the list of chapters in the Organizer makes it a very convenient way to work. There’s search and replace, a word count, spell-checking, writing goals to encourage you, and you can add notes that won’t appear in the final book. Keyboard shortcuts are customisable so you can speed up editing, and you can add auto-replacements for words, phrases or punctuation. You can add images and have text flow to their left or right; and Jutoh provides full support for tables and text boxes if you need them. You can still export your project to a different word processor if you wish, using the OpenDocument configuration – the resulting ODT document can be opened in word processors such as Word and LibreOffice, and you can make PDFs from it. 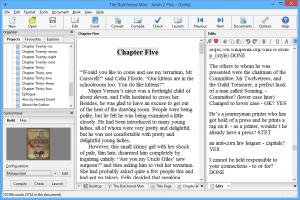 Equally, you can write your book in another word processor and import it into Jutoh before editing it further. My wife Harriet enjoys writing all her books with Jutoh, using Writer’s Café for planning. Another benefit of writing in Jutoh is that at any point, you can easily hit Compile and Launch to see your work as an ebook – definitely a morale boost. It’s also great for editors and proofreaders. You can add a text document under Scraps and drag it to the side of the window so you can see both your notes, and each chapter, as shown in the screenshot above. Jutoh Plus has a very powerful ‘custom compile message’ feature which helps you track down hundreds of typos that you might easily miss during manual proofreading. Author and editor can use Jutoh as an exchange format, and after the initial edit, further corrections and updates can easily be made directly in Jutoh, enabling you to keep tight control over quality. In our experience, editing isn’t a one-off job – it’s hard to upload a perfect manuscript first time and your books will benefit from revisiting and making little improvements. So it’s easier to handle this when your ‘master document’ is in Jutoh and you’re not having to continually reimport from a freshly edited word processor document.